New Jersey’s Kean University is the only American public university to offer a full campus in China where students from the U.S and China study together in an English-speaking environment. Taking advantage of the site’s terrain and natural features, the campus plan draws from both American axial planning principles and local patterns of picturesque canals and waterways. 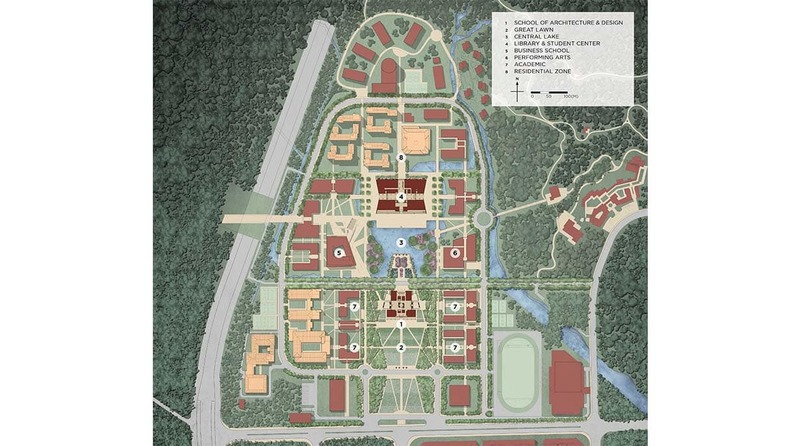 The Master Plan organizes the 175-acre main campus in four districts: Library and Student Center, School of Architecture & Design, School of Global Business and a Performing Arts Center. A powerful central axis, with a lake, a Great Lawn and crisscrossing pedestrian paths, creates a memorable sense of place for students and faculty.